Harvest festival is common across the world. In India, for example, Baisakhi in April is celebrated across the country. To a lesser extent, Sarad Purnima that was day before yesterday, Oct 29, 2012, is also a harvest festival. In Europe, specially Ireland and Celtic region, it is apple, turnip and pumpkin harvest time. Halloween, therefore, gained significance in this part and later on moved to North America, too. Today Halloween is celebrated all over the world, and its origin to Christian faith has gone to the background, at least among those who have different faiths, yet celebrate it with gusto. Halloween is celebrated on October 31 every year, and is now such a big holiday that there are even Halloween eCards by Hallmark available. It marks the end of summer and is a harvest festival. Its celebration is mainly confined to the children. Children donning fancy dresses disguising ghosts, monsters, pirates etc. go from door to door to collect candy, sweets and sometimes small coins. The kids ring the bell, try to frighten the people and announce, ‘ trick-or-treat’ to collect candies and coins. 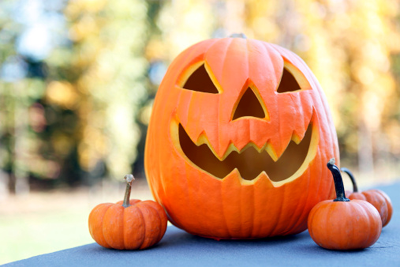 Other activities, besides this most popular one, are lighting bonfires, carving pumpkins into jack-o’-lanterns in the shape of monsters, playing pranks, apple dunking etc. UNICEF too encourages to raise funds to be used for the benefit of the children across the world. This time it is a sheer coincidence that festivals like Bakrid (Oct 27), Sarad Purnima (Oct 30) and Halloween (Oct 31) come close to each other signaling that joys and happiness are common to mankind. Let us celebrate Halloween together and foster friendship and peace among mankind. Let us play pranks instead of waging wars, let us light bonfires instead of firing bullets.